Vintage One: 20 years of Mtn Bike passion and counting. : Then I'm gone. Pulling back the curtains and peering out the window into the dimly lit darkness showed a foggy morning, the street lamps looking like little moons haloed by the moisture in the air. I had no idea how cold it was and was not sure I wanted to find out. I sat in the dim light, not wanting to stir the entire household, pulling on a base layer under the bib knicker's straps, then a wool jersey over that, then finishing with a jacket rolled and tucked into the center pocket. Tires were checked and the sound of a "PSSSFFFttt!" from the presta valves as the Silca pump head was removed, worried the dog who looked a bit afraid that she was going to be invited on the ride. She got up, spun in a circle or two, then laid back down, turning away from me as if to put that idea to rest. Shoes next…ratcheting straps ratcheted, wool head cover pulled on, then helmet, then gloves. The sounds of clacking cleats on the hard floor mixed with the click click click of the free hub as I duck walked to the front door, pulled on the handle and caught a full breath of cool, moist air. A thought came to me. "I could be in a Rapha video right now". Out into the morning, away from warmth and comfort, pedals turn and gears spin as muscles strain to wake up and perform. Maybe the dog was right. I wonder how many times I have done this, this pedaling thing. No idea. I cannot even be sure how old I am at this moment…let's see…my inner abacus whirs and clicks along with the gear changes and a freshly oiled chain, but it's early and math is hard. It is certain that nearly 6 decades on their earth have gone by and I settle on one number or another as my age. Close enough. Until carbon 14 dating gets a bit more accurate or I die and they count the tree rings, that estimation will have to do. What's in a birth date anyway? From birth till somewhere in our 20's we are on an upward swing, getting better and faster and holding a glass half full, our bodies and minds being an optimist. But around the mid 20s, it begins to tilt the other way and some guy comes along with that half empty glass and kicks the half full glass guy in the nuts and steals his glass. From there it's a desperate attempt to keep even status quo in sight. No matter. 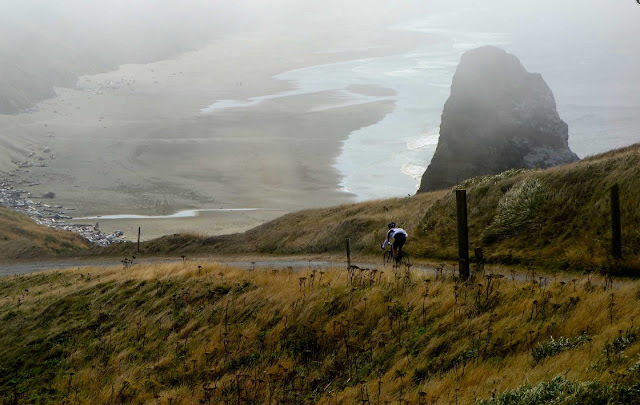 The road turns up and into the fog as moisture from the air condenses on my helmet brim and mixes with sweat on my face. There are no glasses in sight, full or empty. Just the road and the tires and the pedals that require my full attention. The road forks and I stay right, into smooth dirt that I can smell and feel under my tires more than see. Earthy and rich. Water drips from road side plants and I brush them in my hasty weaving, adding to the wetness I am becoming. Not cold anymore. Working harder now and man that feels good. So familiar. How do people live their lives and not do hard things like this? I have the half empty glass guy worried that I might be gaining on him just a bit. And then I am there. The top. I cannot actually see that I am on any summit, as I am covered in clouds. But I know this road, and where it leads. On comes the jacket, fastened tightly for the descent to come. Ears are covered, gloves pulled tight. Somewhere down below there is a barrista who knows me, knows I am out here, and knows what to do about that. And with fast moving hands, jets of steam, and careful pouring of milk into steel cups, he or she is creating aromas that call to me. Click…clack. In the pedals and pushing away. The wind tugs at me, flapping fabrics and pushing beads of water off my helmet in fast streams. Gravity vs. wind. The eternal cyclist battle. I bring in my knees to the top tube, reach for the drops, and lower my head. Things go quiet. I look up, craning my neck to see the next line, the next corner. A foot is dropped to the outside, weight is shifted, and then I am gone. Good read and thanks for taking my mind completely off work for five minutes.